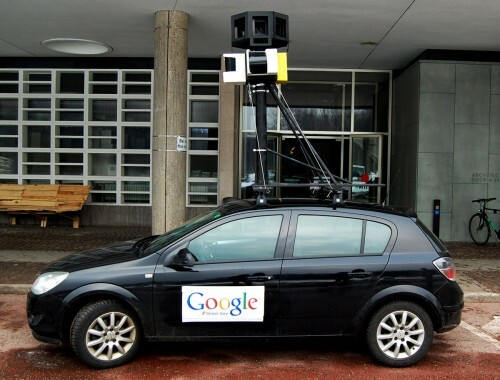 According to F.A.T, Free Art and Technology Lab based out of Germany, they have pranked a Google Street View car by installing a GPS tracking device to it while it was parked outside Haus der Kulturen der Welt in Berlin, Germany. They claim that they were able to somehow attach a tracking device or a GPS cell phone to the car and then receive updates every 2 minutes about the location of the vehicle. They even made a map of the whole think, posting it on their website. According to some reports, there were even people who used the information displayed on the website to track down the car and perform obscene gestures, shout profanity, or display their private parts in the general direction of the vehicle. 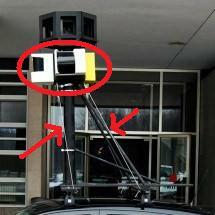 If one looks carefully at the evidence that is presented on the F.A.T website I think that you will can come to the conclusion that they did not actually track a Google Street View Car with GPS, but instead they merely made a fake one and drove it around like it was from Google and filmed funny and obscene episodes to shame the Internet Giant. Let me point out some of the major differences between these two cars – it will become very important later. The first difference is the size of the magnet on the side of the door. The real car has a small magnet while the fake one has a large magnet that takes up most of the door. Hopefully my skillfully crafted circles and arrows highlight the points of difference enough that I won’t have to spend too much time showing how these are different. 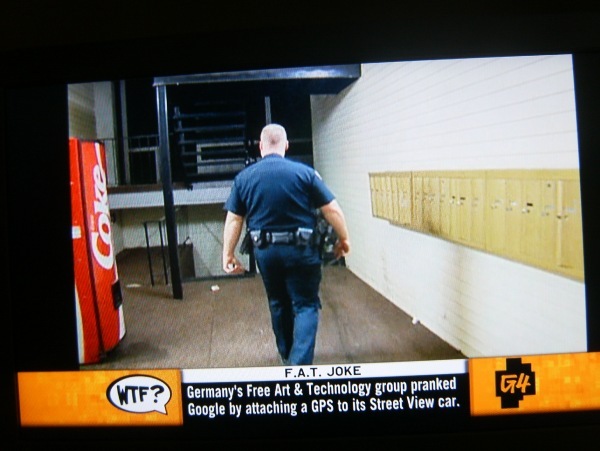 As you can see in these videos, the car is obviously the fake one created by F.A.T. 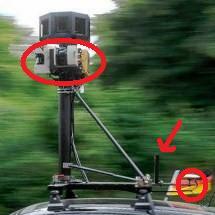 If the sign on the side of the car is not enough evidence then perhaps taking a closer look at the GPS tracking and camera apparatus located on the top will reveal that it is in fact the fake tracker created by the F.A.T group. That last sentence seems to indicate to me that they are representing this as video taken from the GPS tracking of the car, when it is obviously not. The video is clearly of the fake car that F.A.T created. Thus, I think it can be clearly seen that their claim is false and that the claim itself is the actual prank. The videos are made in an attempt to ‘eff Google’ and make them look bad. So in the final analysis it seems like F.A.T. just wanted to make Google look bad and advanced their false claim of GPS tracking a Street View Car in an attempt to bring attention to their cause. I certainly don’t blame them for their attempt, but it is important that we all see what they actually accomplished. 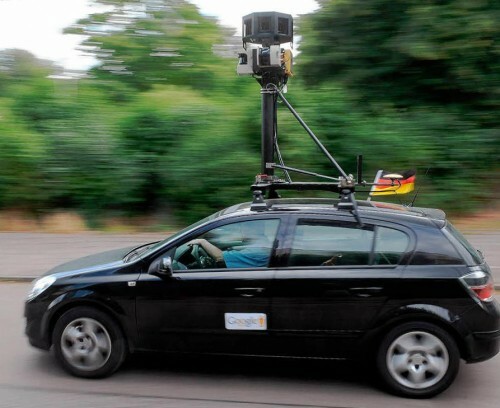 The folks over at Google are turning car tracking into a public service, using the data in an impressive effort to provide traffic information for free to users of their popular Google Maps for Mobile cell phone application. This is a great leap forward in providing useful and reliable information to users all over the globe, but especially in the United States. Being able to get traffic information for free on your GPS enabled cell phone is just another reason to begin ditching those cumbersome and increasingly obsolete GPS navigation devices. Many traditional GPS navigation devices end up charging you for a traffic service – $50 for a year of MSN direct on one device or $90 for a lifetime subscription on one device (Some devices give you traffic updates for free, like the Garmin Nuvi 265WT). If you turn this into a monthly charge, most people are going to end up spending an additional $4 a month to get traffic. 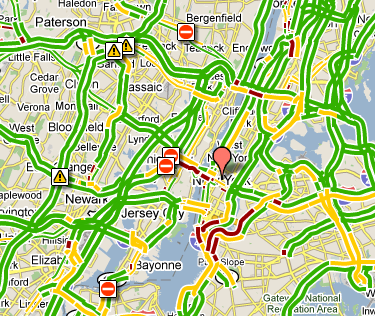 This is no comparison when it comes to the free, real time traffic updates provided by Google. Another advantage to the Google data is that it is crowdsourced. Crowdsourcing is when a task is given to a large crowd of individuals to perform. Generally speaking, crowdsourcing is a great way to gather information. Google is able to do this because they have thousands of customers who currently run their free cell phone tracking application Google Maps for Mobile. All a current user has to do to make their information available for Google to use is turn on the GPS location sharing feature on their phone. This will add your phone’s speed and location to the massive amounts of data already being sent to Google by users all over the roadways. The more information they have, the more reliable their traffic data is going to become. GPS tracking for cars is now becoming useful for everyone. Now why is Google doing this? Is it just out of the kindness of their own heart that they are making this car tracking information available to anyone who wants to use it, free of charge? Well, there are a couple different things that this Internet giant could by trying to accomplish by using cell phones to track cars and get accurate traffic information. The first is the most obvious: they want to improve their current product and services. Google Maps is a wildly popular web application and is becoming just as popular on mobile phones. If they can increase this application’s usefulness they can solidify their user base and create lots of Google Maps evangelists. This could cut into the market share of other online map providers like MapQuest and MSN. Since cell phone make great car tracking devices it is pretty obvious why they chose to leverage their existing cell phone user base instead of creating a brand new Google GPS navigation unit. That just wouldn’t make any sense for the long term since car navigation units are on the decline (or at least so say I). This strategy also has a long term objective as well, creating Google brand loyalty. That way, when they produce something new – like the Android cell phone – they already have a customer base that will become interested in their new product offering. In fact, the Android cell phone is probably going to receive a marked boost from Google having a strong presence in the world of mobile applications. While it is my understanding that this GPS enabled cell phone is not doing that great in terms of market share, I’m sure that Google is in this one for the long haul. So it would appear that in addition to wanting to help out there users they are also are interested in making some money. This is obviously going to the be goals of a corporation so users should not be too concerned about this fact. This is all important information given the fact that some companies (*cough*Palm*cough*) like hijack your personal information, including your phones unique identifier, and send it back to Palm HQ with their unwanted cell phone tracking software. Companies need to take privacy concerns seriously if they want user to entrust their data to them. The second key consideration is how sending all this data is going to affect your data plan. This is probably the more important of the two considerations since this is mainly going to be about money for a lot of people. I have not extensively tested this, so take it with a grain of salt, but I am assuming that if you are already using Google Maps for Mobile extensively and you are fine with your current data plan then you won’t have anything to worry about. But if you push your data plan to its max with your current use then adding the load of sending your GPS coordinates to Google will probably push you over the edge. For some people, this can mean hundreds of dollars depending on what your cell phone provider’s policy is with account overages. This will turn your free real time traffic updates into fairly expensive traffic update. But this is the problem with free GPS cell phone tracking. If you can’t cover the expense of sending your data over the network then it isn’t going to be free. In the final analysis I think that most people are going to benefit a lot from this type of data. According to one recent report released by Navteq, a major supplier of GPS maps, people spend 18% less time when they have access to real time traffic updates. If you extrapolate that data over the course of an entire year that will turn into 4 whole days of time saved. Now that is car GPS tracking that I can live with. But is Google going to succeed with this car tracking system they have created or will it fail? Are cell phones really the tracking device for cars that everyone thinks they are or will the data provided by the modern marvels fail to live up to expectations? Only time will tell for certain, but I for one am extremely optimistic.